The "Kumamoto IGSA & Tatami Conference" has produced a "Tatami-flavored edible chopstick" as part of its promotion to make people think of "Tatami" mats again and acknowledge the superiority of Kumamoto "IGSA" (rush grass). The powder used in this edible chopstick is made from high-quality IGSA of Kumamoto Prefecture, southwestern Japan, that is safe to eat. IGSA is not only edible but highly nutritious "vegetable" containing a lot of dietary fiber, which is equal to 60 times that of lettuce (per 100g). By having one pair of these healthy chopsticks, you can consume about the same amount of dietary fiber contained in one bowl of salad. With this new concept of "edible chopstick," Kumamoto Prefecture attempts to bring back IGSA closer to the everyday lives of Japanese. "Tatami-flavored chopsticks" are all hand-made by Japanese shokunin (craftsmen), and are baked slowly at a low temperature. Chopsticks are manufactured at Marushige Inc., which is located in Aichi Prefecture, central Japan, and is famous for producing edible plates. With Marushige's know-how of making edible plates and high-quality Kumamoto IGSA, Kumamoto Prefecture has developed the world's first Tatami-flavored edible chopstick. The "Kumamoto IGSA & TATAMI Conference" wishes people to recognize Tatami and be aware of the superiority of Kumamoto IGSA by this edible chopstick. Characteristics of "Tatami-flavored edible chopstick"
This edible chopstick contains a plenty of IGSA powder, which is a Tatami ingredient. Baked slowly at a low temperature, this chopstick is crispy and easy to bite. 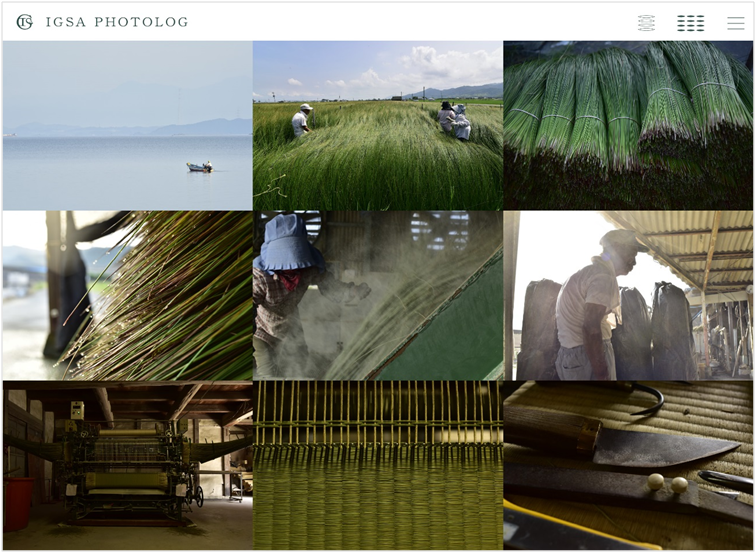 The Kumamoto IGSA & TATAMI Conference and creative agency ROBOT Communication Inc. launched a new photo website, "IGSA PHOTOLOG," on March 21. Its English version was launched on April 29. The website introduces the current situation of IGSA farms and detailed photos of a Tatami-making process in the Yatsushiro area, Kumamoto Prefecture. These photos show beautiful green scenery of IGSA fields, farmers going through tough harvesting, and the shokunin (craftsmen) that even Japanese are not aware of. Project Producer: ROBOT Communication Inc.
Chopstick Shokunin: Toshihiko Takamatsu (TOW), Marushige Inc.